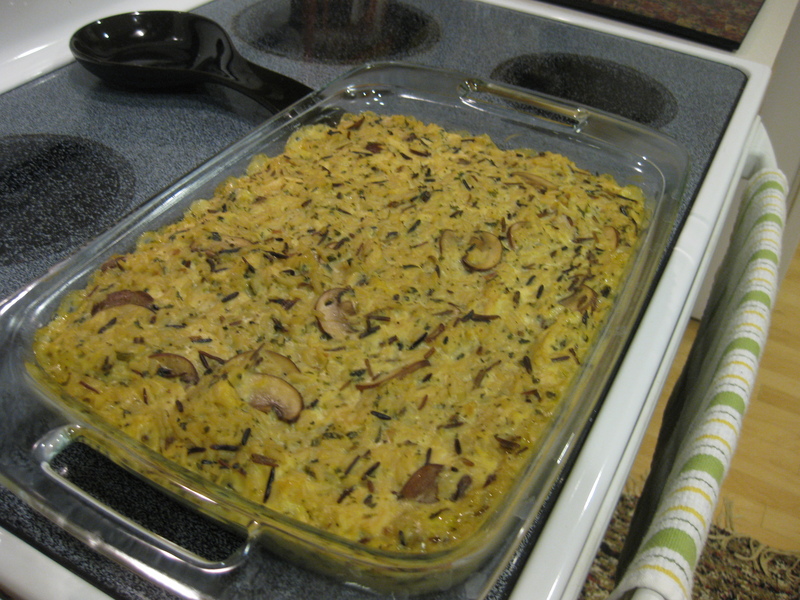 Chicken and Wild Rice Casserole – Go Blondie! Last night for supper I made a chicken and wild rice casserole from Tasty Kitchen. It was pretty good. Carl liked it. I would add some celery, carrots and onions to it if I make it again. It was quick and easy. 1. Cook wild rice according to package directions. While the rice is cooking, melt butter over medium heat in a skillet. Add mushrooms and saute until tender. I omitted this and threw a few onions in as we are not big fans of mushrooms. Add chicken, sour cream and cream of chicken soup to mushroom mixture. Remove from heat. 2. Add cooked wild rice to mixture and combine. Pour into a 2-quart casserole dish and bake at 350ºF for 30 minutes.